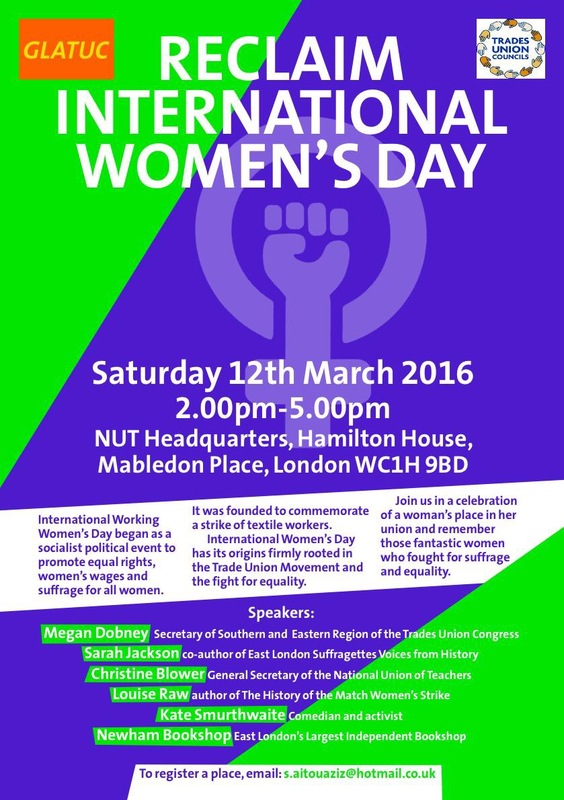 International Working Women’s Day Reclaim International Women’s Day on Saturday 12th March at the NUT Headquarters in Hamilton House Central London. What can you do to make this a great celebration of those fantastic women who fought for suffrage and equality and honour working women across the world? Send the flyer to all your members, contacts and friends. If you love social media , don’t hesitate spread the news … we are reclaiming International Women’s Day. Register a place by emailing s.aitouaziz@hotmail.co.uk . The link on the flyer should work. Let me know if you need more information about the event. Share your ideas about the event. This entry was posted on February 16, 2016 by philipjameslewis.